We at Northern Star are a creative bunch. Different talents and techniques abound. Every year that creativity is put to the test with a new Challenge. Get in on the fun! Our quilt show will be celebrating its 40th anniversary in 2019! 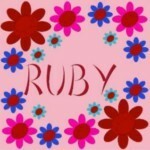 Tradition states that ruby is the gift! So, let’s celebrate our 40th with some beautiful ruby flowers to display at the show. Rose, Zinnia, Cardinal Flower, Dahlia, Hibiscus, Gladiola, Mums, Lobelia, Peony, Geranium, Chrysanthemum, Cosmos, Salvia, Marigolds, Clematis, Poinsettia, Amaryllis, Poppy, Tulip, Calla Lilly, Carnation, Freesia, Petunia, Dianthus & Aster. I am sure there are more. Or you may use the ruby fabric elsewhere. I am sure you can find your inspiration. The possibilities are as endless as the patterns or your imagination! Please email (Challenge@northernstarquilters.com) with your interest so that I have a general idea of how much fabric to purchase. Also in the email let me know how you would like to receive the fabric. I can mail it to you, one package to a group of friends or it can be picked up at the September meeting. 1. Quilt project must consist of 3 layers, back, top and batting all stitched together and quilted by hand or machine and created by one maker. 2. You must use the Ruby Challenge fabric provided to you by the Guild. You will receive a regular 1/4 yard of fabric. 3. You may add as many additional fabric colors that you would like to enhance the Ruby Challenge fabric. 4. You may use your choice of threads or embellishments. 5. The quilt can be constructed in any form you wish, i.e., paper piecing, traditional pattern, appliqué or your own pattern. 6. The quilt size must be 23 inches wide. The length can be up to 30 inches long but that is the maximum size it can be. 7. Attach a sleeve to the back for hanging. 8. Label the back with your name and email address or phone number and the name of the quilt. Deadline: The quilts are due and collected at the FEBRUARY meeting. Voting: Voting takes place at the MARCH meeting. Each member can cast one vote for their favorite quilt in each ribbon category with First, Second, and Third Place ribbons awarded. Display: All quilts are held for display at the NSQG World of Quilts show and returned at the MAY Guild meeting.